Microsoft, the world's largest maker of computer software, has reported a doubling of quarterly profits. It said that earnings were boosted by demand for personal computers that run its Windows operating system and its Xbox video game console. Microsoft also cut costs stemming from its stock-related salary scheme. Net profit was $3.46bn (£1.8bn) in the three months to 31 December, compared with $1.55bn from a year earlier. Sales were $10.82bn. Microsoft's shares rose 1.7% during after hours electronic trading in New York after the company raised its outlook for the current fiscal year. 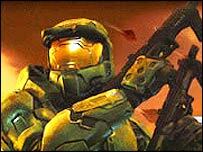 Microsoft said it has benefited from the release of the much anticipated Halo 2 game on the X-box. That helped give its home and entertainment division its first profitable quarter. Operating profit was $84m, compared with a loss of $397m in the same period a year earlier. Chief Financial Officer John Connors said that the division would be unprofitable in the first six months of 2005, and probably will not post a steady profit until the second half of 2006. Microsoft's server and tools division did well during the three months ending 31 December, with operating profit up at $2.52bn from $2.15bn. "The personal computer environment is actually quite healthy," Mr Connors said, adding that large firms were spending more on software for servers, or networked computers. "Home and entertainment was also a highlight for us," he continued.